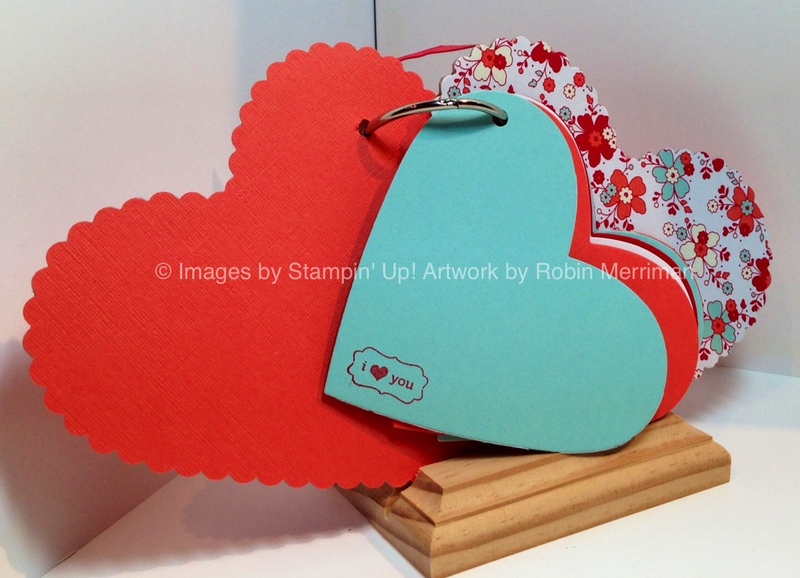 So, scrapbooking is on my mind today - what about you? Have you gotten crafty with any of your photos lately? Tonight is my Oh Scrap! It's Tuesday class here in the studio and it's hands down one of my favorite classes to do. Want to know why?? 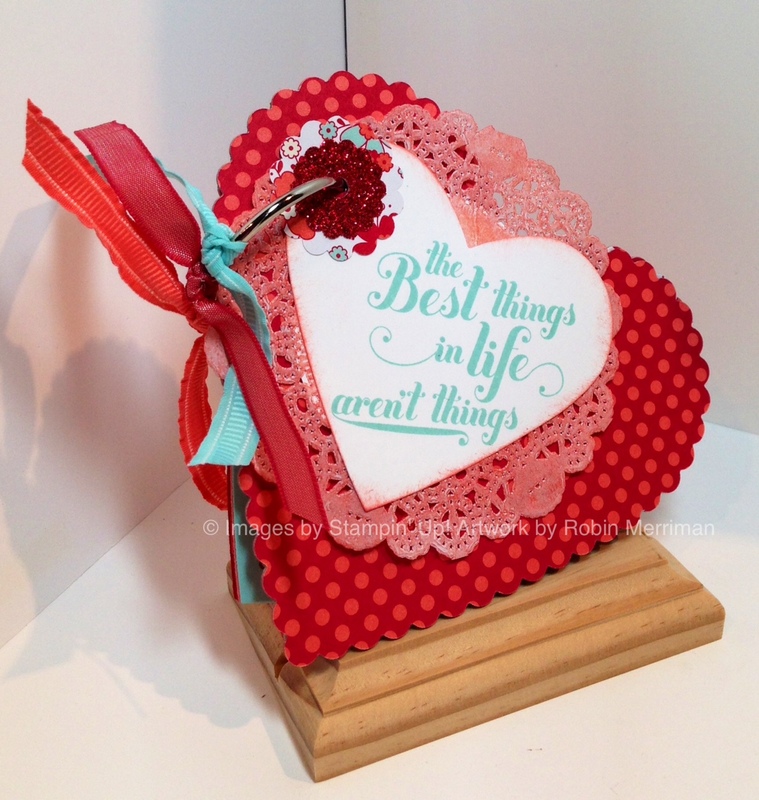 It's because my samples are MY scrapbook pages - so I actually get something done too! LOL! This past Saturday, I was focused on another form of scrapbooking - Mini Albums. I love doing little albums because it's easier to focus on just one event, or one theme, or one person. And they make fantastic gifts as well. This uses two of the envelopes from the Sealed With Love Simply Sent kit that I've been highlighting over the past few posts. I also used the two pieces of cardboard that came with the kit for the album covers. The inside of the covers are done with Calypso Coral cardstock. 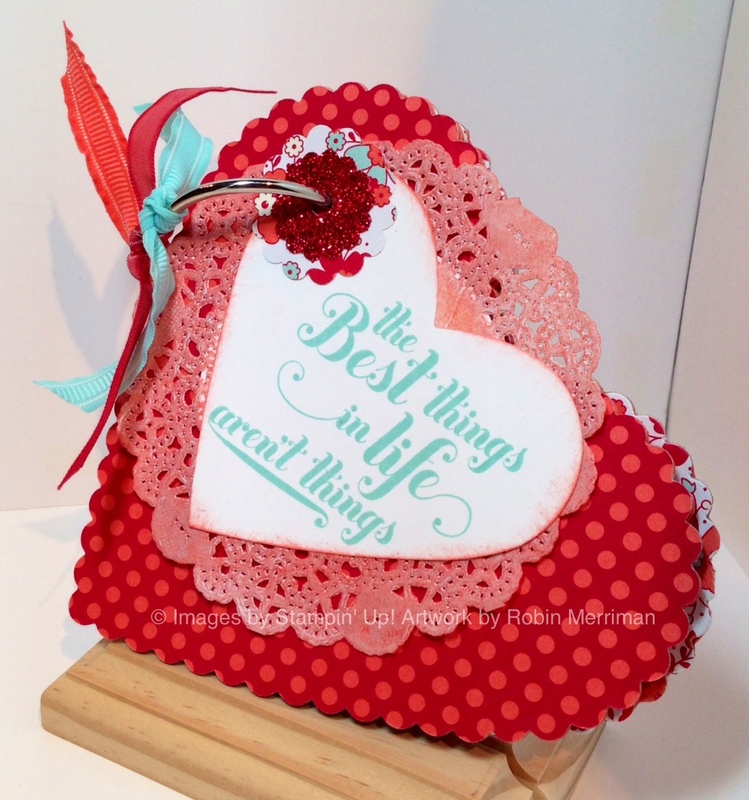 All of those pieces were cut out with the large scalloped heart from the Hearts Framelits set and my Big Shot. They were glued together with Multi-Purpose Liquid Glue. The cover heart is another Framelit from the set, I simply stamped my image from the Feel Goods stamp set first then cut it out. Pool Party ink made a great contrast to the Calypso Coral and Real Red of the cover. I sponged the edges with Calypso Coral and then glued it to a Doily that I'd colored with Calypso Coral ink and my Brayer. There are two scalloped circle reinforcements around the hole punched for the book ring - one is with Red Glimmer Paper and another is with a scrap of the envelope I used to cut one of the hearts. The book ring is a larger one - 1 1/2"- to accommodate the hole that's deeper into the album. I tied it with three pieces of ribbon - Calypso Coral Ruffled Grosgrain, Real Red 3/8" Taffeta and Pool Party Ruffled Grosgrain. I love the frilly look this gives along with the doily. One other thing I did that's not shown is to punch out a piece of Whisper White cardstock with the 2 1/2" Circle Punch and glue it to the back of the doily. This just gave it a bit more heft and that cover piece won't be quite so delicate. These were cut with another heart from the Framelits set and I did 8 of them - 2 each in 4 colors. Pool Party, Calypso Coral, Whisper White and Real Red. That gives you 16 surfaces plus the inside covers for adding photos, mementos and journaling. This is really a super simple mini-album and you can do it with ANY Designer Paper. Plus with the extra large book ring, you can add as many pages as you need to. I hope this project has inspired you to try a mini-album of your own, but watch out, they can become addictive! Simply click the SHOP NOW button at the top right corner to enter the store! Don't forget your FREE Sale-A-Bration product gift for each $50 you purchase - now through March 22nd! Happy Tuesday everyone, I hope you get to stamp something fun today!